One important issue in material flow models is tracing of certain substances, such as heavy metals or toxins. While the overall material flow quantity is less relevant, the focus is on comparatively smaller quantities. The Sankey diagram below shows the Cadmium (Cd) flows in an composting plant (mechanic-biological treatment plant, MBT). 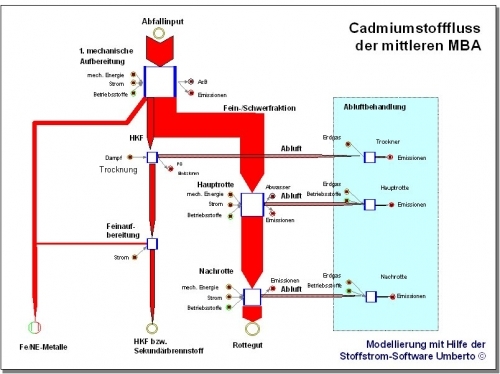 It was created by ifeu Institute in Heidelberg with the material flow management software Umberto. In the modeling software Umberto, the Sankey diagrams are an optional way of displaying calculated material flows.